Israeli forces continued with systematic crimes in the occupied Palestinian territory (oPt) for the week of 13 – 19 September, 2018. Israeli forces continued to use excessive force against unarmed civilians and peaceful protestors in the Gaza Strip. 7 civilians, including 2 children, were killed, while a third child succumbed to his wounds. 278 civilians, including 46 children, 10 women, 4 journalists and 9 paramedics, were wounded. Twelve of those wounded sustained serious wounds. Israeli forces continued to use lethal force against Palestinian civilians, who participated in peaceful demonstrations organized within the activities of the “Great March of Return and Breaking the Siege” in the Gaza Strip, which witnessed for the 25th week in a row peaceful demonstrations along the eastern and northern Gaza Strip border area. During the reporting period, the Israeli forces killed 7 Palestinian civilians, including 2 children, while a third child succumbed to previous wounds in the Gaza Strip. Moreover, 278 civilians, including 46 children, 10 women, 4 journalists, and 9 paramedics, were wounded. In the West Bank, A Palestinian civilian died only few hours after being arrested in light of having suspicions that the brutal beating he was subject to caused his death. Moreover, a Palestinian was shot dead by the Israeli Police in occupied East Jerusalem and wounded 8 Palestinian civilians, including a child and a journalist. 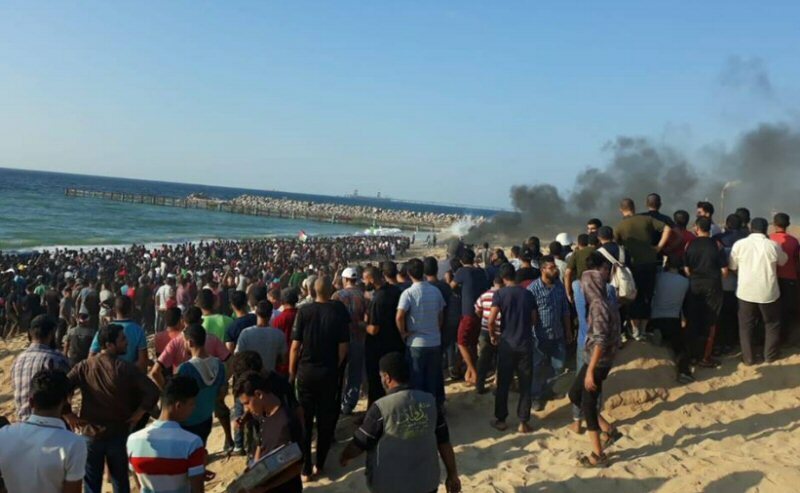 In the Gaza Strip, on 14 September 2018, the Israeli forces killed 2 Palestinian civilians during their participation in the Return and Breaking the Siege protests. The first one was identified as Mohammed Shaqourah (20) from al-Maghazi refugee camp, after being shot with a bullet to the chest in eastern al-Bureij in the central Gaza Strip while the second was identified as Hani ‘Afanah (21) after being shot with a bullet to the chest in eastern al-Shokah village, east of Rafah City in the southern Gaza Strip. On 18 September 3018, the Israeli forces killed 2 Palestinian civilians during their participation in the Return and Breaking the Siege protests in the northern Gaza Strip. Those killed were identified as Mohammed abu Naji (32), from Beit Lahia Housing Project, who was hit with a bullet to the chest, and Ahmed ‘Omer (24), from al-Shati’a refugee camp, who was hit with a bullet to the chest as well. On the same day, the Israeli forces killed 2 Palestinian civilians, including a child, when they approached the broder fence between the Gaza Strip and Israel in eastern al-Qararah village, east of Khan Younis in the southern Gaza Strip. They were identified as Naji Abu ‘Aasi (17) and ‘Alaa Abu ‘Aasi (20); who are both from Bani Suhaila. 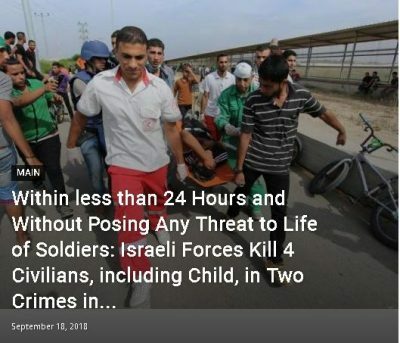 PCHR’s investigations into emphasize that the two killed were civilians who were near the barbed-wire fence that is around 50 meters away from the main border fence. Although no circumstances clarified the reason behind their presence in the scene, they did not pose any threat to the life of soldiers as both were unarmed; moreover, targeting them violates the principle of necessity and distinction as the Israeli forces used unjustified force. On 19 September 2018, Israeli forces killed Mo’men Abu ‘Eyaadah (15) after being hit with a bullet to the head during his participation in a gathering of dozens of civilians in the Return encampment near the border fence between the Gaza Strip and Israel in eastern al-Shokah village, east of Rafah City in the southern Gaza Strip. In the same context, the medical sources at the Gaza European Hospital in Khan Younis on 15 September 2018 declared the death of Suhaib Abu Kashif (16) from Khan Younis refugee camp, after succumbing to his wounds. The aforementioned child was wounded with a bullet to the neck during his participation in the Return March activities in eastern Khuza’ah village, eat of Kahn Younis on 03 August 2018. As part of using excessive force against the peaceful protestors along the Gaza Strip borders, the Israeli forces during the reporting period wounded 278 civilians, including 46 children, 10 women, 4 journalists and 9 paramedics. The injury of 12 of those wounded was described as serious. As part of targeting the border areas, on 14 September 2018, the Israeli forces stationed along the border fence between the Gaza Strip and Israel in eastern Khan Younis, fired an artillery shell that fell inside Abu T’eimah Elementary School for Noys and Girls in ‘Abasan al-Kabireh village. As a result, two classrooms sustained damage, and the school was suspended in the next day. It should be noted around 2500 female and male elementary and preparatory students go to the aforementioned school on 2 shifts. As part of targeting Palestinian fishermen in the Gaza Sea, the Israeli forces continued to escalate their attacks against the Palestinian fishermen, pointing out to the ongoing Israeli policy of targeting their livelihoods. On 13 September 2018, the Israeli forces arrested 3 fishermen and confiscated their boat off al-Sheikh ‘Ejlin shore, west of Gaza City. In the West Bank, Mohammed al-Khatib, from Beit Rima village, northwest of Ramallah, died only few hours after being arrested by the Israeli forces on 18 September 2018. His family said that the Israeli forces had brutally beaten him before arresting and taking him to an unknown destination. In the morning, the family received a phone call from the Palestinian Liaison informing them that their son died. On the same day, Israeli police officers opened fire at Mohammed ‘Alian (26), from Qalendia refugee camp, north of East Jerusalem, wounding him with 15 bullets throughout his body, and immediately died. The Israeli police claimed that the abovementioned attempted to stab an Israeli settler who was walking in al-Mesrarah area near the Damascus Gate in the central of the occupied City. During the reporting period, Israeli forces conducted at least 75 military incursions into Palestinian communities in the West Bank and 6 similar ones into Jerusalem and its suburbs. 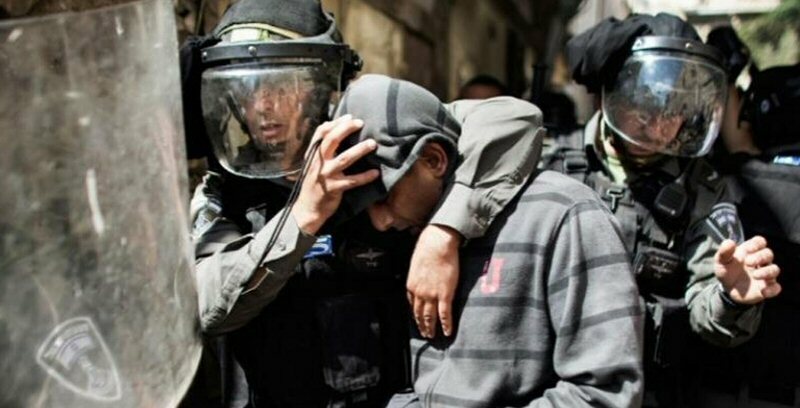 During those incursions, Israeli forces arrested at least 42 Palestinians, including 5 children, in the West Bank. Meanwhile, 33 other civilians, including 3 children, and a French activist were arrested in Jerusalem and its suburbs. In the Gaza Strip, on 13 September r308, the Israeli forces moved 50 meters into al-Shokah village, east of Rafah in the southern Gaza Strip. On 14 September 2018, the Israeli forces moved 70 meters into eastern al-Qararah, east of Khan Younis. In the 2 incursions, the Israeli forces levelled lands along the border fence between the Gaza Strip and Israel. As part of the house demolitions and other civilian objects, on 13 September 2018, the Israeli forces demolished 5 dwellings temporarily set by Palestinian activities near Khan al-Ahmar and called it Wadi al-Ahmar village in solidarity with the Bedouin Community that is decided by the Israeli authorities to be demolished and its residents to be displaced. As part of the Israeli settlers’ attacks against Palestinian civilians and their property, on 13 September 2018, settlers burnt 200 olive trees located in al-Menia village, south of Bethlehem, and belonging to the Sa’ir village residents in eastern Hebron. On the same day, a group of settlers attacked civilian houses in Jaloud village, southeast of Nablus. They slashed the tires of 6 cars with sharp tools and spray-painted hate graffiti against Arabs on the walls of a house in the village. On 18 September 2018, a group of Israeli settlers established mobile houses in “Khelet al-Nahlah” area, which is a 400-dunum hill off Urtas village, south of Bethlehem. They raised the Israeli flag on the hill and supplied it with electricity. Hasan Breijeyah, Head of the Settlement and Wall Resistance Commission in Bethlehem, said that there is an Israeli plan to establish a settlement outpost and connect it with “Afrat” Settlement, south of Bethlehem, until it reaches the eastern lands of Bethlehem and then turn towards “Har Homa” settlement, which has become of West Jerusalem’s neighbourhoods. Mohammed al-Khatib, from Beit Rima village, northwest of Ramallah, died only few hours after being arrested by the Israeli forces. PCHR calls for an immediate and impartial investigation into the death circumstances of al-Khatib and expresses its deep concern that the Israeli forces had possibly practiced torture against him. According to PCHR’s investigations and eyewitnesses’ accounts, at approximately 06:00 today, 18 September 2018, Israeli soldiers sneaked into Beit Rima village, northwest of Ramallah, via a civilian white Volkswagen Caravelle with a Palestinian registration plate. The vehicle stopped near a house belonging to the family of Mohammed Zaghloul al-Khatib (24), and the Israeli soldiers stepped out of it to raid al-Khatib’s bedroom. They had brutally beaten him before arresting and taking him to an unknown destination. In the morning, an Israeli officer called the brother of the abovementioned and asked him if Mohammed suffers from a certain disease, but his brother denied so. Shortly, the family received a phone call from the Palestinian Liaison informing them that their son died. It should be mentioned that al-Khatib was previously wounded by the Israeli forces with a bullet to his foot one year and a half ago. At approximately 22:50 on Thursday, 13 September 2018, Israeli forces stationed along the border fence between the Gaza Strip and Israel, east of Abu Safiyah hill, northeast of Jabalia in the northern Gaza Strip, opened fire at a group of civilians, who approached the abovementioned border fence. As a result, a 27-year-old civilian from Jabalia was hit with live bullet shrapnel to upper part of his body and doctors classified his injury as moderate. At approximately 16:00 on Friday, 14 September 2018, thousands of Palestinian civilians protested in the east of Malakah intersection, east of al-Zaytoun neighborhood, east of Gaza City. A number of them approached the border fence with Israel, set fire to tires and attempted to throw stones at the Israeli soldiers. The soldiers stationed along the border fence fired live bullets and tear gas canisters at the protestors. As a result, 47 civilians, including 7 children and 2 women, were wounded. Thirty three of them were hit with live bullets, and 14 were hit with tear gas canisters. At approximately 16:30 on the same day, hundreds of civilians swarmed to the Return encampments established by the Supreme National Authority for the Great March of Return and Breaking Siege, 400 meters away from the border fence between the Gaza Strip and Israel, east of al-Buraij in the central Gaza Strip. Dozens of them approached the border fence, set fire to tires and threw stones at Israeli soldiers stationed behind sand barriers along the border fence. The Israeli forces fired live bullets and tear gas canisters at the protestors. As a result, Mohammed Khalil Ghazi Shaqourah (20), from al-Maghazi refugee camp, was killed after being hit with a live bullet to the chest. Moreover, 13 civilians, including 2 children and a paramedic, were wounded. Twelve of them were hit with live bullets and their shrapnel. Dena Ibrahim Hasan Salem (22), a volunteer paramedic at PRCS, was hit with a tear gas canister to the left thigh. Around the same time, thousands of civilians swarmed to the Return encampment, east of al-Shawkah village, east of Rafah in the southern Gaza Strip. A number of young men approached the border fence, flew kites, set fire to tires and threw stones at Israeli soldiers stationed behind the border fence. The soldiers sporadically fired live bullets and tear gas canisters at the protestors. The clashes continued until approximately 19:00 on the same day. As a result, Hani Ramzi Mohammed ‘Afanah (21) was killed after being hit with a live bullet to the chest when he was about 100 meters into the west of the border fence. He was reported Dead on Arrival (DOA) at Gaza European Hospital in Khan Younis. Moreover, 19 civilians, including 4 children and a paramedic, were hit with live bullets and their shrapnel. The paramedic identified as Zuhair Mahmoud Abdul Ra’ouf al-Sheikh (Jouda) (30) was hit with a live bullet to the right leg. The wounded civilians were taken to the medical point in the Return encampment, east of Rafah, and then transferred to Abu Yusuf al-Najjar Hospital in Rafah and Gaza European Hospital in Khan Younis. Doctors classified 3 civilians’ injuries as serious. Around the same time, thousands of civilians, including children and elderlies, protested in the east of Khuza’ah village, east of Khan Younis. Hundreds of them approached the border fence with Israel, set fire to tires as a number of them threw stones at Israeli soldiers. The Israeli snipers stationed behind sand barriers along the border fence fired live bullets and tear gas canisters at the protestors, who were about 300 meters away from the main border fence. As a result, 25 civilians, including 4 children, were wounded. Doctors classified 3 civilians’ injuries as serious. Reem Mansour Abdul Jawad Shatat (20) was hit with a tear gas canister and bruises to the pelvis. At approximately 22:00 on Saturday, 15 September 2018, Israeli forces stationed along the border fence between the Gaza Strip and Israel, east of Malakah intersection, east of al-Zaytoun neighborhood, east of Gaza City, opened fire at a group of civilians, who approached the border fence. As a result, a 16-year-old child was hit with a live bullet to the left foot. At approximately 23:35 on the same Saturday, Israeli forces stationed along the border fence between the Gaza Strip and Israel, east of Abu Safiyah Hill, northeast of Jabalia in the northern Gaza Strip, opened fire at a group of civilians, who approached the border fence. As a result, a 25-year-old civilian from Khan Younis was hit with a live bullet to the right thigh. He was taken to the Indonesian Hospital. Doctors classified his injury as serious due to a cut in the main artery in the thigh. The wounded civilians were then transferred to al-Shifa hospital in Gaza City. At approximately 20:00 on Sunday, 16 September 2018, dozens of Palestinian civilians gathered in the Return encampment near the border fence between the Gaza Strip and Israel, east of al-Shawkah village, east of Rafah in the southern Gaza Strip. They set fire to tires and fired fireworks and turned on sounds similar to warning sirens. The soldiers sporadically fired live bullets at civilians. As a result, a civilian was hit with a live bullet to the upper limbs. At approximately 20:20, Israeli forces stationed along the border fence with Israel adjacent to the Return encampment, east of Khuza’ah village, east of Khan Younis, fired live bullets at a group of Palestinian young men, who protested in the area. As a result, a 26-year-old civilian was hit with a live bullet to the right thigh and Mazen Suleiman Mahmoud Qdaih (25), a reporter at Rebat Radio Station and a photographer at Noor News Network, who was hit with shrapnel to the left hand palm. At approximately 16:00 on Monday, 17 September 2018, hundreds of Palestinian civilians protested near the border fence between the Gaza Strip and Israel in al-Sefa area (adjacent to “Zikim” military base), northwest of Beit Lahia in the northern Gaza Strip. It should be noted that this is the seventh time for Palestinian boats to sail for breaking the Siege from Gaza Seaport towards the northern Gaza Strip coastline. The Israeli gunboats heavily opened fire at the boats for breaking the siege that approached the water barrier established by the Israeli forces. The Israeli soldiers stationed along the border fence heavily fired live bullets, sound bombs and tear gas canisters at the protestors. As a result, 59 civilians, including 12 children and a woman, were wounded. Thirty eight of them were hit with live bullets and their shrapnel and 21 were hit with tear gas canisters. Doctors classified 4 civilians’ injuries as serious. At approximately 23:35 on the same day, 2 other civilians were wounded in eastern Abu Safiyah Hill in the northern Gaza Strip after the Israeli forces fired live bullets and tear gas canisters at a group of civilians, who approached the border fence between the Gaza Strip and Israel. At approximately 22:00 on the same Monday, Israeli forces stationed along the border fence with Israel adjacent to the Return encampment, east of Khuza’ah village, east of Khan Younis, fired live bullets at a group of civilians, who protested in the area. As a result, a 26-year-old civilian was hit with a live bullet to the chest. At approximately 17:00 on Tuesday, 18 September 2018, Israeli forces stationed at the Beit Hanoun “Erez” Crossing in the northern Gaza Strip fired live bullets and tear gas canisters to disperse hundreds of civilians who were protesting near the crossing upon calls from the National Committee of March for Return and Breaking the Siege to participate in the “Together for the Rights of Refugees and Breaking the Siege” activity. The Israeli Forces’ shooting resulted in the killing of 2 civilians who were identified as Mohammed Ahmed Mohammed Abu Naji (32) from Beit Lahia Housing Project who was hit with a bullet to the chest; and Ahmed Mohammed Muhsen ‘Omer (24) from al-Shati’ refugee camp who was hit with a bullet to the chest. Moreover, 44 civilians, including 7 children, 2 women, 3 journalists and 2 paramedics, were wounded. Seven of the wounded were hit with bullets while the rest were directly hit with tear gas canisters in addition to dozens who suffered tear gas inhalation. Further, a tear gas canister hit and broke the window of a PRCS ambulance. The two paramedic, who work at PRCS were identified as Jamal Ibrahim Ahmed al-Sayed (30), was hit with a tear gas canister to the head and Shaima’a Hani Ibrahim al-Masri (20) was hit with a tear gas canister to the pelvis. The wounded journalists were identified as Tha’er Khalid Fehmi Abu Rayash (24), a journalist at the Turkish Newspaper, was hit with a tear gas canister to the right knee, and Mohammed ‘Atef Mohammed al-‘Arabid (23), a photojournalist at the North Media Network and Palestine News Network, was hit with a tear gas canister to the face. At approximately 22:00 on the same Tuesday, Israeli forces stationed along the border with Israel adjacent to the Return encampment, east of Khuza’ah village, east of Khan Younis, fired live bullets at a group of young men, who protested in the area. As a result, a 22-year-old civilian was hit with a live bullet to the lower limbs. At approximately 16:30 on Wednesday, 19 September 2018, 7 civilians were hit with live bullets during their participation in a demonstration that was organized near the border fence with Israel, adjacent to “al-Namer Gate” belonging to the Israeli forces, east of Deir al-Balah in the central Gaza Strip. At approximately 20: on Wednesday, 19 September 2018, dozens of civilians gathered in the Return encampment near the border fence between the Gaza strip and Israel, east of al-Shawkah village, east of Rafah in the southern Gaza Strip. They set fire to tires and fired fireworks at the soldiers. The Israeli soldiers sporadically fired live bullets. As a result, Mo’men Ibrahim Salim Abu ‘Eyadah (15) was killed after being hit with a live bullet to the head at approximately 23:30 on the same day. Mo’men died before his arrival at Abu Yusuf al-Najjar hospital in Rafah. Moreover, 3 civilians were hit with live bullets and its shrapnel. A approximately 23:30 on Saturday, 15 September 2018, medical sources at Gaza European Hospital in Khan Younis announced the death of Suheib Abdul Salam Mohammed Abu Kashef (16), from Khan Younis refugee camp, succumbing to his wounds. Suheib was hit with a live bullet to the neck during his participation in the activities of the Return March in the east of Khuza’ah village, east of Khan Younis on 03 August 2018. Suheib was at that time taken to Gaza European Hospital and doctors classified his injury as serious. He then stayed at the Intensive Care Unit (ICU) until his death was announced. Following the Friday Prayer on 14 September 2018, dozens of Palestinian children and youngsters moved into the entrance to Beit Ummer village, north of Hebron where the Israeli forces established a military watchtower. When they arrived at the area, the Israeli soldiers chased them amidst firing sound bombs and tear gas canisters. The soldiers then arrested 5 children and took them to the military watchtower. The arrestees were then transferred to a detention center in “Gush Etzion” settlement, south of Bethlehem. The arrestees were identified as: Qais Mohammed Kamel Abu Maria (15), Khatab Wahid Hamdi Abu Maria (16), Rakan Nasser Abdul Hamid Abu Maria (15), Sayel Jihad ‘Ali Sabarnah (16), and Mahdi Ibrahim Abdul Hamid Abu Maria (15). At approximately 13:40 on the same Friday a group of Palestinian civilians moved from Kufor Qaddoum village, northeast of Qalqiliyah, to the eastern entrance to the village, which has been closed for 15 years. The protestors chanted national slogans demanding end of occupation and and condemning the Israeli forces’ crimes against Palestinian protestors along the eastern border of the Gaza Strip within “The Great March of Return and Breaking the Siege” activities. The protestors threw stones at Israeli soldiers stationed behind sand barriers. The Israeli soldiers fired rubber bullets, sound bombs and tear gas canisters at them. As a result, Nidal Shafiq Taher Eshtiyah (49), a journalist at New China News Agency, was hit with a rubber bullet to the chest. At approximately 17:30 on Saturday, 15 September 2018, a similar demonstration was organized. The Israeli shooting resulted in the injury of a 47-year-old civilian with a rubber bullet to the right leg. At approximately 04:00 on Thursday, 13 September 2018, Israeli bulldozers leveled Wadi al-Ahmar village that was established by Palestinian activists near Khan al-Ahmar Bedouin Community that is threatened to be demolished. Eyewitnesses said that the Israeli forces accompanied with the Israeli Civil Administration staff moved into Wadi al-Ahmar village, imposed a closure on it and then declared it as a closed military zone. The Israeli bulldozers demolished 5 dwellings temporarily established by Palestinian activists near Khan al-Ahmar Bedouin Community and called it Wadi al Ahmar village in solidarity with Khan al-Ahmar Bedouin Community, which is decided by the Israeli authorities to be demolished and its residents to be displaced. On Wednesday morning, 12 September 2018, the time given by the Israeli Supreme Court to vacate the Kahn al-Ahmar Bedouin Community established in East Jerusalem ended. It should be noted that the Israeli Supreme Court rejected a petition filed by the residents of Khan al-Ahmar Bedouin Community against the decision of vacating their community and demolishing its building. At approximately 07:00 on Friday, 14 September 2018, Israeli forces besieged Khan al-Ahmar Bedouin Community, east of occupied East Jerusalem, and closed with sand berms the roads leading to it. An Israeli bulldozer closed a sub road leading to Wadi al-Ahmar village, which was leveled the day before in the dawn in the northern area of the community adjacent to “Kfar Adumim” settlement. Following that, the Israeli bulldozers moved towards the eastern areas adjacent to the main road leading to Khan al-Ahmar Bedouin Community to level it. Moreover, dozens of Khan al-Ahmar Bedouin Community residents and activists sit in on the main road (Jericho- Jerusalem) in protest against closing the sub roads leading to the Community. The Israeli forces attacked the protestors to disperse them. In addition, a hand fight occurred between the protestors and Israeli forces, in which 3 civilians from the community were arrested in addition to a French activist holding a US passport. The persons arrested were identified as Ibrahim Hussain Mousa Abu Dahouk, Suliman ‘Eid Yameen Hathaleen, ‘Omar ‘Abdullah Ahmed al-Haj, and Frank Romano. The coordinator of “Save Khan al-Ahmar Community” Campaign, Abdullah Abu Rahmah, said that the Israeli authorities extended the arrest of the abovementioned activist to 4 days. He added that the activist declared his hunger strike until the decision to demolish Khan al-Ahmar will be cancelled. It should be noted that Frank Romano is a Law Professor at the French Sorbonne University and he is in solidarity with Palestinians and has been in the sit-in for many days in Khan al-Ahmar community. On Thursday, 13 September 2018, a group of Israeli settlers burned around 200 fruitful olive trees in al-Minyia village, south of Bethlehem. Those trees belong to civilians from Sa’ir village, east of Hebron. Zayed Kawazbah, Head of al-Minyia Village Council, said that the Israeli settlers burned 10-dunum agricultural lands. It should be noted that the Israeli settlers escalated their attacks against the olive trees as the harvest season is coming next month. 1-Mohamed Kamal Farhan ‘Abbad: punctured the tires of his agricultural vehicle. 2- Hussain Kamal Farhan ‘Abbad: punctured the tires of his agricultural vehicle. 3-‘Ali Kamal Farhan ‘Abbad: punctured the tires of his agricultural vehicle. 4-Hisham ‘Emad Ahmed Hammoud: punctured the tires of his agricultural vehicle. 5-Mohamed Hisham ‘Emad Hammoud: punctured the tires of his vehicle. 6-Riyad Ahmed Hammoud: punctured the tires of his vehicle. On Tuesday, 18 September 2018, a group of Israeli setters established a number of mobile dwellings in Khelet Nahlah area, which is a 400-sqaure-meter hill adjacent to Artas village, south of Bethlehem. The Israeli settlers fixed the Israeli flag on the hill and suppled it with electricity. Hasan Barijiyah, Member of the Wall and Settlement Resistance Commission in Bethlehem, said that a number of Israeli settlers from “Efrat” settlement brought mobile dwellings to the area after supporting them by the Israeli Agriculture Minister, Youri Ariel, who visited the area and said that it is called “Giv’at ‘Enam“ that is one of the Jewish Holy sites, so we cannot give it up and shall build on it.” Hasan Barijiyah also said that there is a plan to establish an outpost and connect it with “ Efrat“ settlement, which extends longitudinally from southern Bethlehem on al-Khadir village lands to reach the eastern Bethlehem and then turns towards Har Homa settlement which has become one of West Jerusalem’s neighborhoods. This plan only constitutes part of the Greater Jerusalem Project that is gradually applied by Israel. It should be noted that the settlers previously established a number of mobile dwellings in the abovementioned area, which was vacated upon a decision by the Israeli Supreme Court following a petition submitted by the lands’ owners and Settlement Resistance Commission. After around 20 minutes, an Israeli drone launched 2 missiles at the same area. Later, the Spokesperson of the Israeli forces. Another instance of death is the case of Aziz Awisat, a 53 year old from Jerusalem, who was brutally assaulted and attacked by his jailers at Eshel prison. The assault resulted in a stroke at Ramleh prison clinic on May 9. He was transferred to Assaf Harofeh Medical center where he lost his life on May 19 2018. The occupation have continued with their systematic policy of holding dead bodies captive under several justifications. Currently, they are holding a total of 253 corpses, including 24 new bodies since October 2015. Among the detained bodies are Aziz Awisat, Mohammad Anbar, Mohammad Marshoud, Misbah Abu Sbaih and many more. This article was originally published by Addameer: Prisoner Support and Human Rights Association. Source: AIC.